Size: The state record is 2.34 pounds. The Big Catchminimum qualifying sizes are 1.25 pounds or 11 inches for adults, and 0.75 pounds or 8 inches for youth (BigCatchFlorida.com). 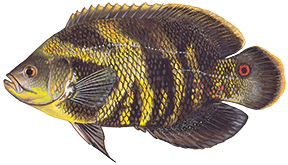 Identification and similar species: A dark fish, the oscar is black with variable olive to red markings on most of the body. The key identification aid is the bright red eyespot at the base of the tail. Oscars have a stout, more oval body shape than native bream and a thick mucus coat on the body. Young fish have wavy white and orange markings on a black background. Angling qualities: Oscars provide hard-fighting, panfish-type fishing and are a perfect spring or summer target. The oscar strikes a variety of baits including crickets, live worms, Missouri minnows, and grass shrimp. The best artificial baits include small jigs tipped with cut bait and small spinnerbaits or Beetle Spins; fly fishing with a variety of sinking flies is also productive. Oscars provide a boom-or-bust fishery since they may periodically experience winter kills. But when abundant, angler catch rates are exceptional. There are no bag or size limits for this nonnative species. The white, flaky meat has good flavor. Where to catch them: Most abundant in canals of the Everglades Water Conservation Areas of Collier, western Miami-Dade, Broward, and Palm Beach counties, where this species ranks second in popularity only to largemouth bass. Occurs throughout south Florida, but typically not as abundant as in marsh-related canals. Interesting facts: The native range of this exotic includes the Orinoco, La Plata, and Amazon river basins in South America. The oscar was one of first exotic fishes reported in Florida in the late 1950s. The female typically lays about 3,000 eggs and both parents can occasionally be seen guarding hundreds of young in shallow water along shorelines. Fish illustration by Duane Raver, Jr.